Owls were also popular in jewellery and coinage as Athena was the patron goddess of Athens and her symbol was the owl. 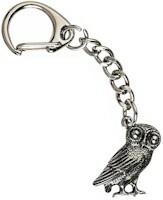 This pewter Greek owl is made from lead-free pewter and is supplied on a quality key chain. A reproduction Greek Athenian coin mounted on a quality key-chain. A pewter Gladiator figure on a quality key chain. There are a mixture of four gladiators supplied, Secutor, Retiarius, Thracian ans Samnite. This Roman style leather plaited bracelet comes in two styles and is supplied on a card. Silver plated torc supplied with an information card that describes how torcs were worn during Roman times and also about the mosaic on the front of the card. Pewter T-Rex ring supplied in a clear blister on an information card which explains about the Therapods and the most famous member, Tyrannosaurus Rex.